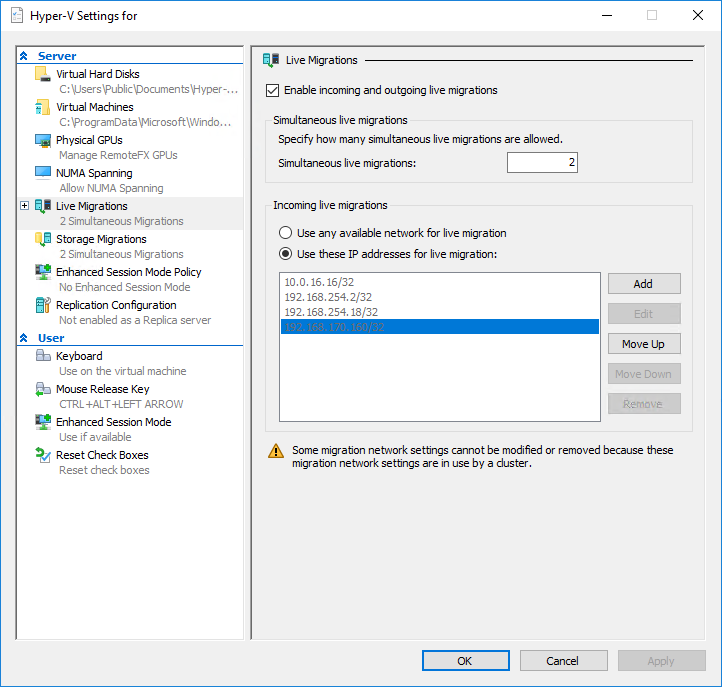 "Some migration network settings cannot be modified or removed because these migration network settings are in use by a cluster" in Hyper-V manager, Hyper-V Settings after a node is non-cleanly evicted from a failed cluster - C:Amie (not) Com! The IP/Subnet addresses shown on the form will be greyed out and you will be unable to edit the live migration network settings. This will not solve the live migration settings issue highlighted above. Underneath this key there will be a key for each entry shown on the Live Migration Settings screen. The keys will be named Network# e.g. Network0, Network1, Network2 and so on. You will now be able to add, edit and delete the live migration settings.